Not actually a garlic or mustard. A super highly nutritious healing powerhouse, garlic mustard is one of the first plants to come up early in spring and stays years round. It is said to be one of the most nutritious leafy greens ever analyzed. It's used to treat gangrene, ulcers, has vitamin A, C,(called "North American Wasabi") Dry the leaves, powder it and use as great spice. Can be mixed with horseradish for the familiar greenish colored wasabi used in sushi places. The leaves are shiny with white flowers. Leaves look similar to Ground Ivy, but have sharp toothed edges and smell like mustard, while Ground Ivy has rounded scalloped edges and smells like mint. Both plants are edible, there are no poisonous lookalikes. The best time to consume garlic mustard is when the young shoots come out of the ground, just before the white flowers show up. The stalks are the best part, but you can eat the whole plant. 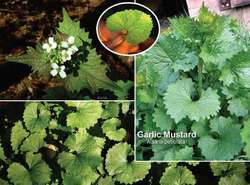 Garlic mustard is very aggressive and will overtake a forest or garden because it's roots put out a chemical that kills beneficial soil organisms that allow other plants to grow. Do not replant it in your garden or property because it will overtake everything. Used for asthma, antiseptic, bronchitis, eczema, antibacterial.